alaTest has collected and analyzed 28 reviews of BTC 6300CL Full-Size Ultra Slim Luminescent Multimedia Keyboard. The average rating for this product is 4.8/5, compared to an average rating of 4.2/5 for other products in the same category for all reviews. Reviewers are impressed by the durability. The usability is also appreciated, whereas some have doubts about the price. We analyzed user and expert ratings, product age and more factors. Compared to other products in the same category the BTC 6300CL Full-Size Ultra Slim Luminescent Multimedia Keyboard is awarded an overall alaScore™ of 81/100 = Very good quality. Keyboard with low profile and EL Lights. If you don't like the blue backlighting you can disable it by pressing F10+ESC. A little pricey but well worth it!! I ordered this after reading carefully about the version that doesn't light up. I got this in TWO days! I was not expecting it. Hopefully it lasts long, its doing fine so far! BTC 6300CL Full-Size Ultra-slim Luminescent keyboard looks great with your black or metallic-tone display. In the dark, a soft - blue luminescent light is emanating through its transparent backlit keycaps. It will be shut off automatically if you didn't use it during 3 minutes. 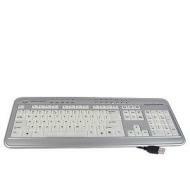 Full size design features include both soft-touch and tactile-feedback keys. Twelve multimedia and Internet hotkeys and one power-management hot keys enhance productivity.